Taking care of your physical, emotional, and mental health is absolutely essential for your success in college. At Catholic University, you’ll find the professional support you may need to help you deal with your health and wellness. 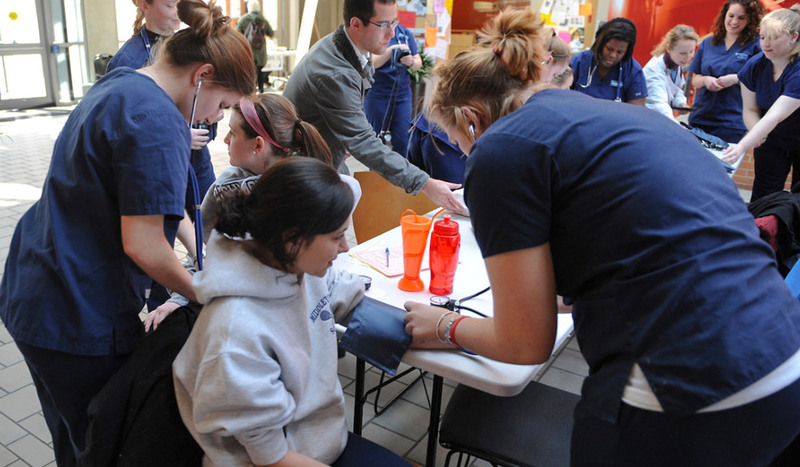 We offer a range of services for students to safeguard their health and wellness. Feeling sick or had an accident? Student Health Services provides primary health care to all students with an emphasis on health maintenance and illness prevention. Medical care and advice is consistent with the teachings of the Catholic Church. The Student Health Services staff includes a board certified family physician, three nurse practitioners, an LPN, an RN and an office manager. Life can be hard and sometimes you may need extra help. The Counseling Center is there to help you make the most of yourself as a developing person — more comfortable and effective in your own life and in your relations with others. There is no fee for counseling, psychotherapy, or psychiatric consultations for full-time students. However, the Counseling Center may refer a student to an off-campus provider should it be determined that the student’s needs will be better met elsewhere. The Kane Student Health and Fitness Center provides you the opportunity to maintain and develop a healthy lifestyle. The center offers group workouts, conditioning, and individual training programs. Disability Support Services provides programs and services designed to support and encourage the integration of students with disabilities into the mainstream of the University community. Your safety is very important! Sign up for CUAlert to receive critical safety-alert text messages.